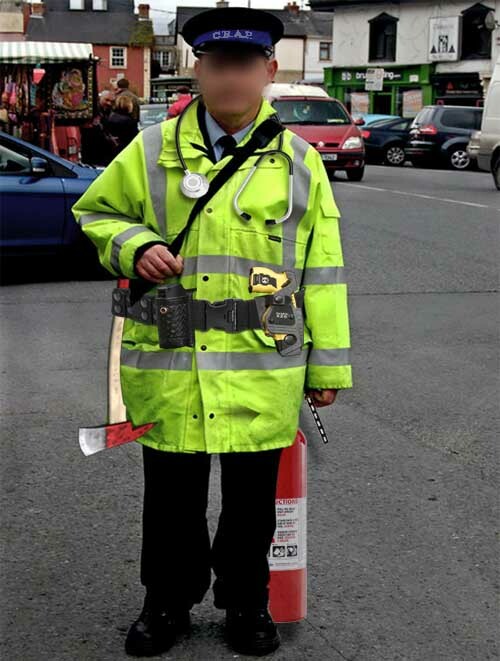 Rural areas of the UK will soon be served by a new team of multi-disciplinary Traffic Wardens. In addition to their normal duties, the highly trained cadre will respond to all 999 calls and are equipped to tackle emergencies such as fires, burglaries, heart attacks and delivering baby lambs via caesarian section. The ‘Combined Response and Protect’ unit (C.R.A.P.) have been deployed initially throughout North Wales and Western Cornwall. This morning we spoke to Mrs Angela Stopes, a bee farmer from Ruthernbridge in mid-Cornwall, who recently encountered a member of the new force and was less than impressed.‘Well, he arrived on his scooter pretty fast,’ she said, after her car overheated and caught fire while parked on double yellow lines and her husband had collapsed in panic.